Dr. Brown is a member of the 2011 graduating class in emergency medicine at Palmetto Health Richland. Following residency she completed a two-year fellowship in global health at George Washington University. She is now an attending at Palmetto Health. During my second year of residency, I had an amazing opportunity to spend a month working in the emergency room at Scheer Memorial Hospital in Banepa, Nepal. 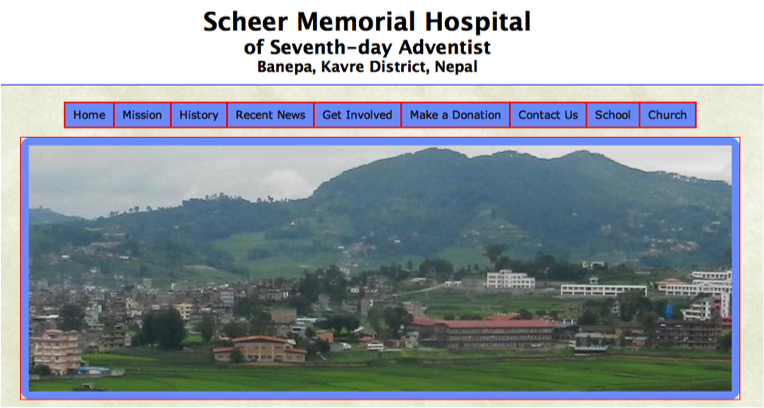 Scheer is a missionary hospital 30 km outside of Kathmandu. Scheer has a six bed emergency room open 24 hours a day and multiple specialties available. The staff is a mix of seasoned western physicians and young Nepali house staff. However, there are no emergency trained physicians in the hospital and the emergency room is staffed by the Nepali house staff who are straight out of medical school. There were certainly plenty of opportunity to make a serious impact and I was ready to do just that! I have had a passion for international medicine since I was in college and couldn’t wait to experience a part of the world I had never been to before. After a sixteen-hour flight, I had finally arrived and was ready for adventure. Kathmandu did not disappoint. The Kathmandu airport was absolute chaos. I was immediately overtaken by cab drivers who wanted to drive me to Banepa for an insane amount of rupees and vendors selling everything from water to snake oil. I was finally able to find a police officer who directed me to an honest cab driver who drove me to my destination 30 km away. As we wove through dusty city streets and up winding mountain roads, I was sure of one thing – I was going to die in the back of that cab. We ducked and weaved through the dirt streets with no lanes and buses overloaded with thirty extra people sitting on top of the bus. Un-helmeted drivers on motorbikes were driving right toward us and swerving at the last minute. Somehow, I arrived at the hospital in one piece and I was exhausted. For the most part, the emergency room patients at Scheer were not all that different from the ER patients I was used to here in Columbia, except the typical gastroenteritis patient in Nepal had typhoid and the typical pneumonia patient had tuberculosis. I saw a lot of trauma patients (mostly motorbike crashes), many whom had serious injuries and the hospital was ill-equipped to handle. The nearest CT scanner is in Kathmandu 30 km away. The hospital had no cervical collars so these patients were frequently placed in the back of the ambulance with no C-spine precautions down the bumpy road to Kathmandu an hour away. During my second week working in the ER at Scheer, a man came running through the front gate carrying his wife who was minimally responsive. In her early twenties, she was just over a month postpartum. The patient had apparently been struggling with postpartum depression and without any type of mental health system available to her, she had drank a liter bottle of organophosphate based fertilizer in a suicide attempt. After multiple vials of ativan and pralidoxime (the antidote for the fertilizer she had consumed) the patient continued to deteriorate. She was intubated and the sole ventilator belonging to the hospital was brought down from the ICU. Despite aggressive treatment with the appropriate drugs, the patient died later that day. There were three other suicide attempts via organophosphate poisoning I encountered during my month in Nepal. Unfortunately psychiatric treatment is very rare in Nepal and mostly reserved for the acutely psychotic. That’s right! Nepal’s new year is in April and I had the opportunity to celebrate in Bhaktapur with some of visiting American medical students and Krishna, one of the young Nepali physicians who worked at Scheer. The festivities start the night before in the town square just before sunset. A large chariot is constructed every year for the occasion and placed at the top of the hill in the center of the town square. Several local children climb up on the chariot and slowly rock back and forth. Krishna had warned us not to stand too close as we could quite possibly be run over. We decided to pick a safe spot near the bottom of the hill. We did not realize that we were still at risk for being crushed by the panicking mob running from the chariot or the chariot itself, which had an unpredictable trajectory when it suddenly started rolling. However we managed to escape unscathed. The next day the chariot became a makeshift temple where the people of Bhaktapur came in droves to sacrifice their best livestock. Fresh flowers and rice lined the streets where the citizens of Bhaktapur marched playing flutes and drums. It was definitely a unique cultural experience unlike anything I’ve experienced before. My trip to Banepa was an overall amazing experience and my first opportunity to look at an emergency department in a developing country from a system’s perspective as opposed to just direct patient care. As someone who has decided to make a career out of systems development in developing countries, I cannot express how thankful I am to have trained in a residency program and hospital supportive of such ventures.